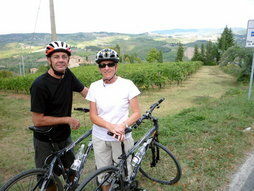 Our 'Chianti 1' ride was the absolute highlight of our recent trip to Florence -I loved every minute and even Sally, who is not a fan of hills, enjoyed the ride tremendously. It has given her lots of confidence for our cycling holiday in France later this year. Elizabeth was a fantastic host and made our day perfect -Greve was just lovely (and a great butcher's shop) and the restaurant for lunch was fantastic, especially her wine recommendation! Many thanks for a great ride in the most perfect of surroundings. Thank you once again for what was a truly memorable day for my family. I am sure we will never forget it and there are few days in life you can truely say that of. The extra short tour around the lookouts on the drive home rounded it day off magnificently. 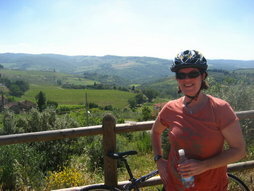 Any one with a grain of cyclist in them should make the Chianti loop a must on a short visit to Florence. The service, bikes and the company of the guides was faultless. I look forward to retuning to Italy in the future, ( I am working on Sue now), to tackle the climbs of the Giro in the Dolomites. We are back in USA but more than a little sad to be truthful. Our Italy vacation seemed too short. Just as Janet and I were getting into our Latin Groove, bingo, the dance was over. After we left you in Florence, we had a great few days in Cinque Terre and then in Venice. 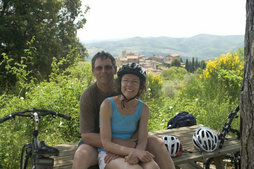 But most of all, our fondest memories are from Tuscany, especially the bike ride with you. Take care, keep up the good work. Hi Marco, Your bike tour was one of the highlights of our recent holiday, we had a fantastic day and you looked after us so well. Many thanks once again and I hope to meet you again in the future on another ride or here in Australia if you come this way. I've been mountain biking everyday recently.... which of course usually end with some wine when the ride is over. If you ever come to Australia please come and stay with us. Amy Zielinsky, New York, U.S.A. I just got back yesterday from the rest of my wonderful trip.The bike ride in the hills was definitely one of the best highlights of my vacation. Thanks again for a wonderful time. I would like to come back one day for another, longer ride! Thank you again for a great day. Lyne and I wish you the best, for you and your business. Your kindness made us love Tuscany and its people. Ann and Todd Christian, California, U.S.A. Sorry it has been so long since our trip - amazing how time flies. Todd and I just wanted to thank you for an amazing ride through the wine country. It was a wonderful way to finish off our 2 week Italian Vacation. Also, we loved your friend's resturant in Florence, it was wonderful (down home Florence cooking). We do hope our paths cross again. If you come to Northern California, please let us know. 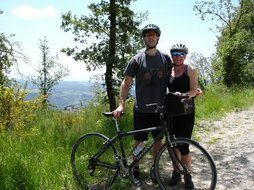 We just got back from Italy yesterday and I must tell you that our bike trip with you and Jodi was my most favorite day of all! I can't get the beautiful scenery and towns out of my head. The wine tour and tasting was like something out of a storybook! Tell Jodie we all said hello and if you are ever in Pittsburgh, give us a call! THANK YOU FOR THE MEMORIES! Joe and Phyllis Snoddy, Glenwood Springs, Colorado, U.S.A. Sorry it has taken so long to get back to you. We are not sure of the name of the ride we did, but If you remember it was the last week of June and you picked us up in Florence. We were going to do one of the easier wine rides but you told us that the castle that we were supposed to tour was not open that morning. You told us about another more difficult ride up a dirt road to a small village which I believe was called Volpaia. You convinced me, and I convinced my wife that we should do that one. Your description of the ride was right on and it proved to be pretty challenging and quite rewarding. We wanted to write a testimonial for you since we had such a fabulous time and even though it was difficult we really enjoyed it. The ride was fun, the bikes were perfect, your companionship was great and it was the highlight of our vacation. I would highly recommend your tours to everyone.